Billboard advertising is one of the better choices in the urban area as they are the most visible structures that greet (or distract) you every time you pass through such advertisement. 2) Unipole 20ft x 60ft/80ft, constructed 30ft above ground, rental per year: RM 300,000 onward. Then there is the cost of replacing computer printed vinyl, labour charges, GST and lightings which add up to few more thousands of RM.. Under IRB (LHDN) taxation system there are rebates for individuals or companies who donate to the museums, book/painting galleries, etc. Explore this option for educative advertisement such as 'Keep Our City Clean', 'Drive Faster Proceed to Hell', 'Clean River Saves Water' and 'Say No To Smoking', "Kurangkan Pembaziran Berbelanja Dangan Bijak', etc. Sorry, but if everything else fails, consider removing those blank billboards. City centre - empty unipole billboard. Why don't DBKK take up the huge space? This board is right in front of its nose. Putatan: Servey Hypermarket should really take this up at possibly reduced rent rate as this has been empty for sometime now. This board is located right at the junction leading to the big mart. KK-Papar road. If you are driving up from Papar to Kota Kinabalu, this sight will soon become a common experience. Grand Millennium: as if the nuisance created by the 'stray' concrete wastewater pipes is not enough, the empty billboard stands out as the bigger eyesore winner. Donggongon: "Excuse me, are you taking down all of those? That'll be nice.."
QEH roundabout - Kenapa tidak digunakan ruang kosong ini untuk bercerita sedikit tentang bangunan QEHospital yang tidak selamat tu! Kalau RM245juta tiada masalah, apalah sangat RM24.5k sewa billboard tu untuk setahun...? 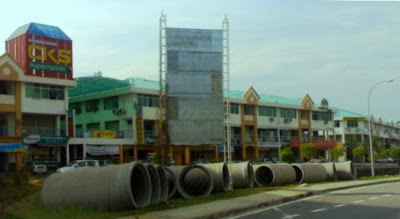 Tuaran: There is another empty billboard facing this eyesore that is better off taken out. Oh..and remember sometime ago someone proposed for marriage to his girlfriend through huge billboard advertisement? Yes those were in Luyang and Tg. 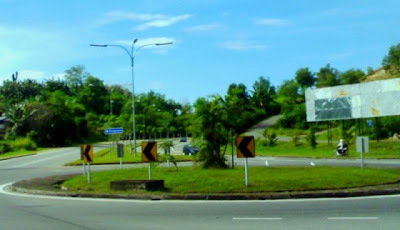 Aru-Papar junction. Let's wish few more will spend big to repeat such feat. No idea how much that gentleman spent then but the one in Damansara Puchong Highway last year was said to have 'invested' RM40,000 for it. Hehe..I like the word invest when it come to spending. For a change, check this out for a nice billboard adverts!